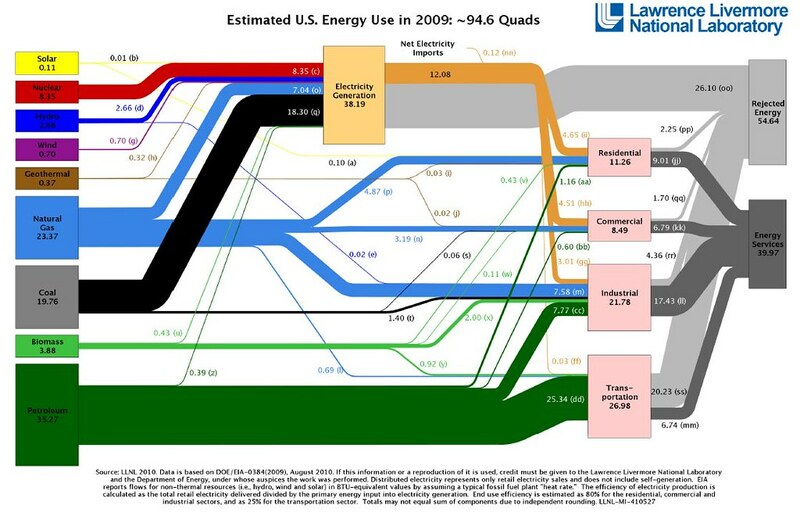 This page looks at the consumption of energy in the United States. Measurement of energy, as you may know, is very subjective depending on the context and purpose of the measurement and the energy being used. One could say that from Los Angeles, CA to Washington, D.C. the distance is 2,663 miles driving. However, a pilot would say that the distance is actually 2,288 miles. Consequently, either mode of transportation may look at the gasoline used as total gallons or the total gallons of gasoline per person, whereas the values of time and convenience are also measured. It is more efficient to buy a plane ticket for this long voyage than taking almost two whole days driving, nonstop. The U.S. Department of Energy and others measure the consumption of energy at the point of use. This means that an appliance’s energy consumption is measured when it is being used. However, energy is inevitably lost when extracted, generated, transmitted, and distributed from its source to its end user. However, it seems that the industrial sector had a larger variance within the thirty-five years of the study, which will be discussed further. The primary total energy consumption for the United States in 2009, which we may consider current, was 94,578 trillion Btu, according to the EIA, which divides the energy per sector for past years in this table. There are currently many debates concerning the future of the world's energy. Some say we will be unable to fulfill energy demands with projected supplies, yet others suggest the world will be able to sustain itself because natural resources are nowhere near depleted and our technology will prove to be more efficient as time progresses. According to the EIA, the world's primary energy consumption in 2007 was 467.786 Quadrillion Btu's (467.786*10^15 Btu's). The irregularity, however, is that the world's total primary energy production was 465.620 Quadrillion Btu's (465.620*10^15 Btu's), according to this site. 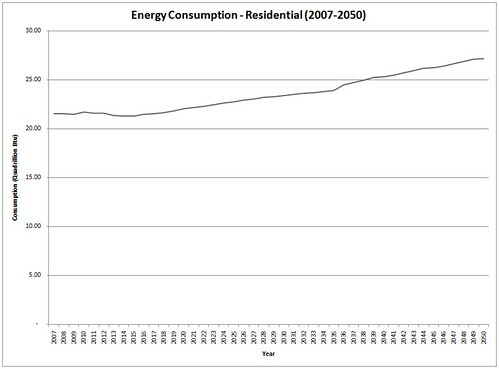 The EIA provides a forecast of energy consumption in the United States up to 2035 and one can see all their information by clicking here. 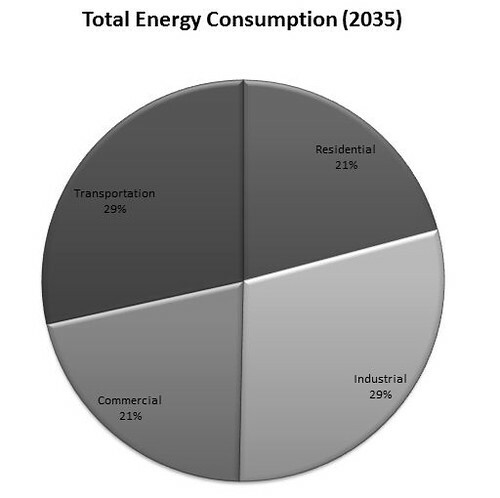 According to the EIA's findings, the total energy consumption in 2035 would be of 114.512 quadrillion Btu's, which is about a 20% increase from current consumption. • Calculate the average percent change from already existing data (last 10 available years) and multiply that rate plus 1 times the previous available year, all the way down to 2050. • Calculate total energy use (quads) by multiplying the GDP and energy intensity for each respective year. 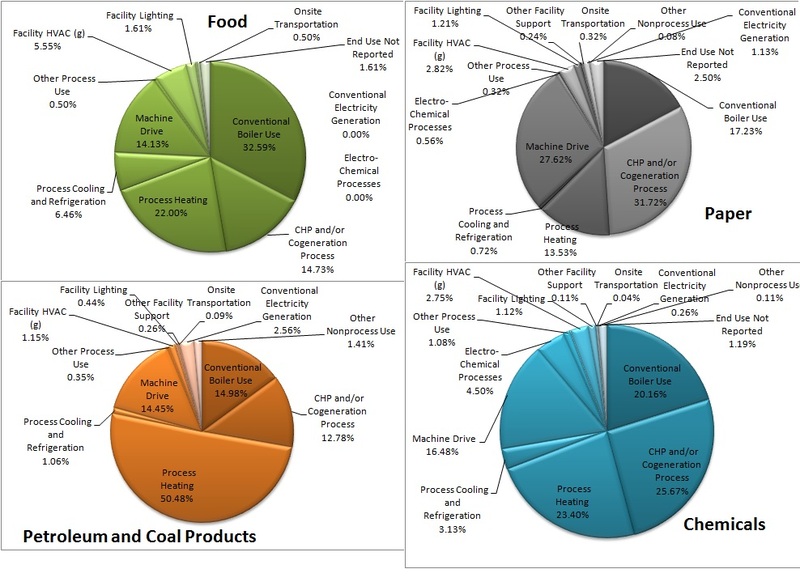 Sectors were then divided up and, through existing data, an average percent of total energy use per sector for each year was calculated, and the average of that was used to calculate the energy use per sector (by multiplying the last average and the total energy use (quads) for each year). To view the calculation results in an Excel document, click here. 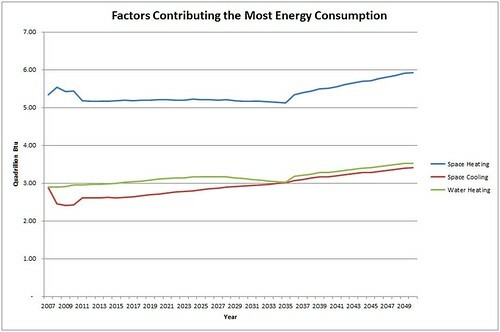 The Department of Energy conducts a Residential Energy Consumption Survey (RECS) which provides information on energy consumption in residential housing units in the U.S. like what type of housing units are, which appliances are used to heat or cool the housing unit, demographics of the household, and what source of energy is used. 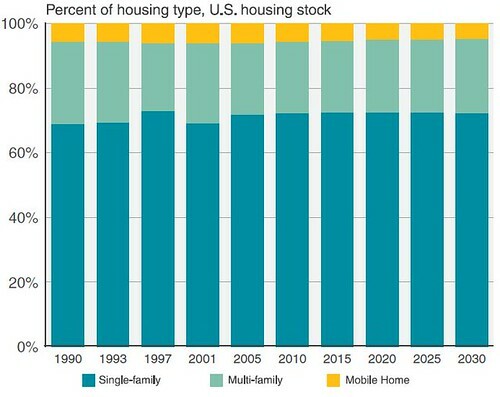 In 2005, 4,382 households were given the RECS, statistically selected to represent the 111.1 million housing units in the U.S.
Homes have been increasingly getting larger for the past two decades. Just in 1997, 29% of homes had seven or more rooms, compared to 22% in the late 1970s. Also, in 1997, 30% of housing units had one to four rooms, most of which are accounted by apartments and studios. 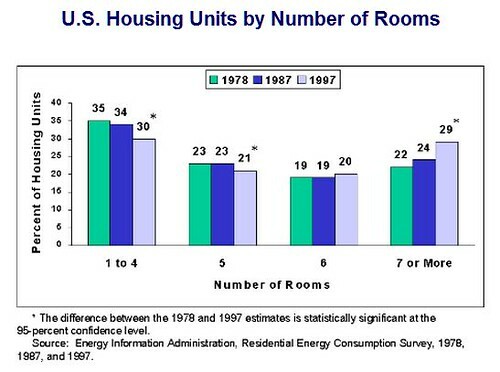 However, the percentage of "one-to-four rooms" per housing unit has been decreasing (35% in 1978; 30% in 1997). 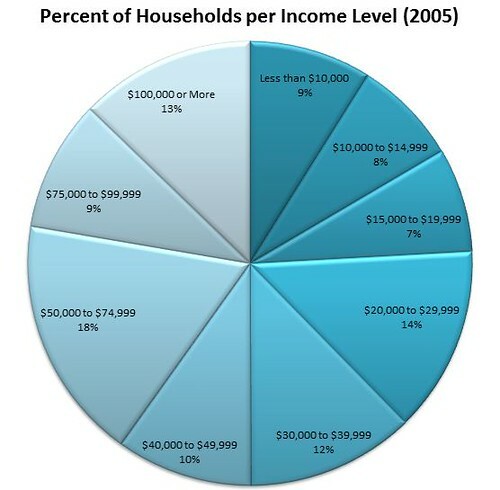 In 2005, most of the households in the U.S. were made up of households with an income of $50,000 to $74,999 (19.8%) and $20,000 to $29,999 (15.1%). 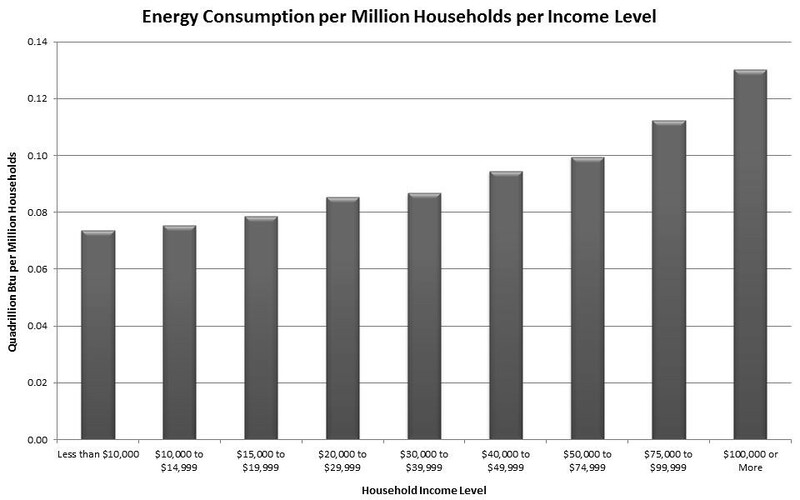 However, as household income increases, the tendency is to use more energy. For example, 0.09 quadrillion Btu were used for every one million households with an income of $20,000 to $29,999; 0.13 quadrillion Btu were used for every one million households with an income of $100,000 or more. Currently, majority of the households are in the South of the United States, followed by the Midwest region, the Northeast region, and finally the West region. Most households would rather be in the South and Midwest regions due to the climate in that area. Hence, given that space heating is the factor that consumes the most energy within the residential sector, people will not be using so much energy as they would in the Northeast region of the United States. However, GDP is considered to be a major factor in the Northeast region, since many large firms exist in that region, giving people employment. 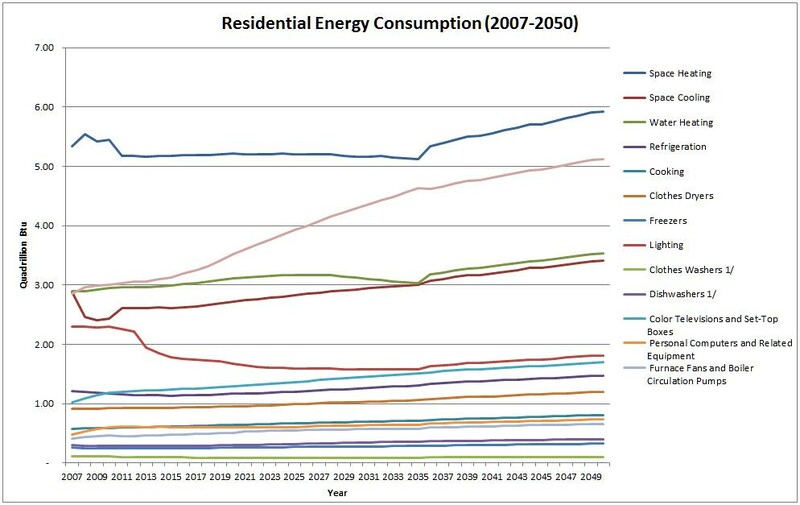 Residential energy sources can be depicted from the following charts. Note that what is shown is the delivered energy. Energy delivered in the residential sector was about 10.8 quadrillion Btu, with projections to rise, according to this graph. Electricity and natural gas take up most of the energy delivered to residential buildings (84.3%), remaining constant in the future. 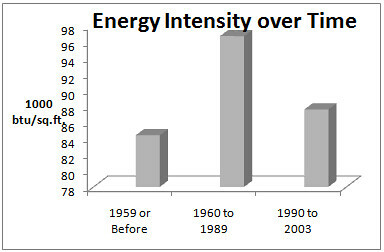 On the other hand, the primary energy consumed in residential buildings is shown in the following graph. Although electricity and natural gas remain the most used forms of primary energy in the residential sector, as is the case with delivered energy, electricity is much more dominant, given that more energy is lost through electricity. Furthermore, each year, electricity is being generated more and more by natural gas and other main sources rather than just coal like in the past. It can also be noted that the reason for the larger increase in electricity consumption, compared to natural gas for example, may be because of the increase in home electronics. As the GDP per capita increases and the amount of households increase, as noted later, the populace may purchase more and larger electronic goods such as televisions, surround sound systems, personal computers, and other miscellaneous lighting equipment. Large households may have every light turned on within and other lights outside, have numerous televisions (including the kitchen), and many times have more than one refrigerator. In 2010, lighting would account for about 10.1% of the total primary energy consumption. Although lighting factors to energy consumption in the residential sector are expected to decrease (6.8% and 5.9% of total primary energy consumption in 2020 and 2030 respectively), "other" factors are expected to increase from 18.5% of total primary energy consumed in 2010 to 22.2% of total primary energy consumed in 2030. The "other" category includes small electric devices, heating elements, motors, swimming pool heaters, hot tub heaters, outdoor grills, and natural gas outdoor lighting, all of which alludes back to the increase in population and GDP. For example, an iPhone 3G's battery being charged with its original charger is charged at a rate between 4 watts/hour and 6 watts/hour. When charged using a USB connection, the device's rate increased to 12 watts/hour. Note that this is simply looking at the rate by which the phone is charged and not the total energy consumption because, if the device is kept on during charging, we would have to subtract that energy per second that is consumed by the phone from its battery like if it were not charging, and add that to the energy transfered from the outlet to the iPhone's battery. Also, some people are not aware that energy is consumed after, for example, one uses a kitchen appliance and does not unplug it. A toaster, for instance, still consumes energy after one is finished using it, since there is still a flow from the outlet to the toaster. Similarly, a clock radio that is left on 24 hours/day for every day of the year consumes about 44 kilowatt/hours total throughout the year. A typical hair dryer that is used 15 minutes/ day, for example, consumes about 100 kWh per year. A coffee maker that is used 30 minutes/day consumes about 128 kWh per year. If you have a medium-sized aquarium at home and all its functionalities are on 24 hours/day, that consumes about 700 kWh per year. To see energy consumption of other appliances, click here. The U.S. EIA also provides a chart with other appliances. Furthermore the factors that contribute to the most energy consumption within the residential sector are space heating, space cooling, and water heating. Like energy consumption as a whole, these factors are expected to constantly rise, with improvements in technology considered. A larger and more specific representation of the use of energy in the residential sector is depicted below. The line that radically increase, surpassing water heating, space cooling, and even lighting represents the "other" category which includes factors that stand for the increase in GDP per capita as shown in Goldman Sachs' report, Global Economics Paper No: 153. 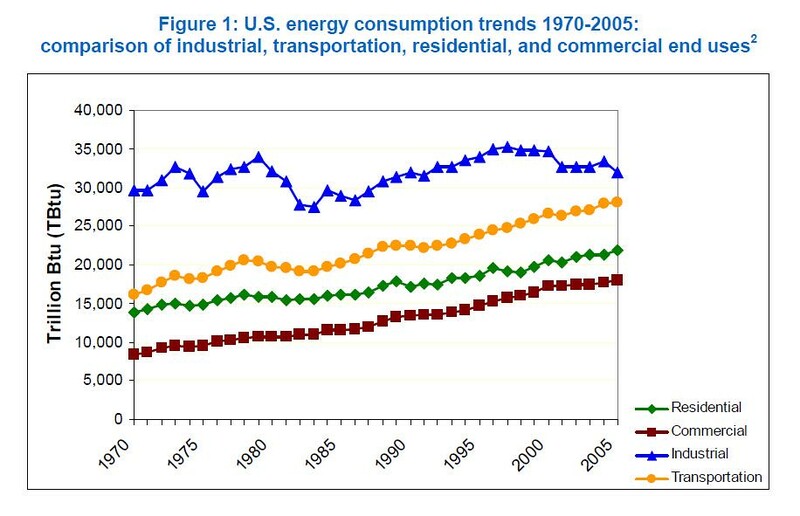 Second only to the industrial sector, transportation is a major consumer of energy. In the U.S., it is the largest consumer of petroleum-based fuels. 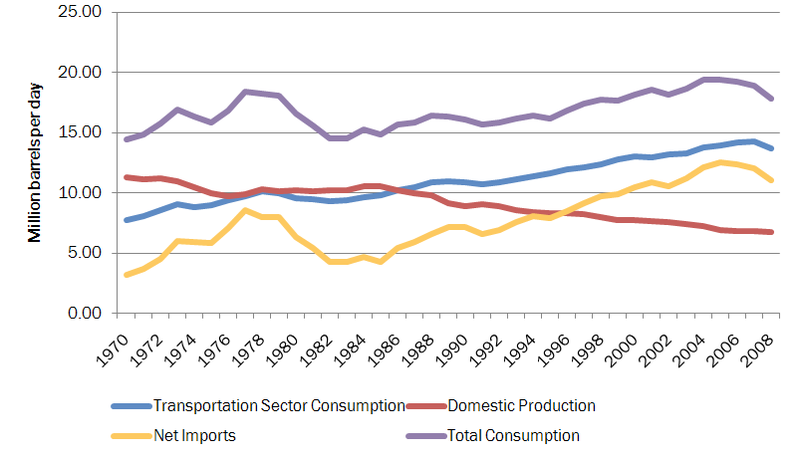 The following chart illustrates the transportation sector's consumption and overall consumption along with production and imports. 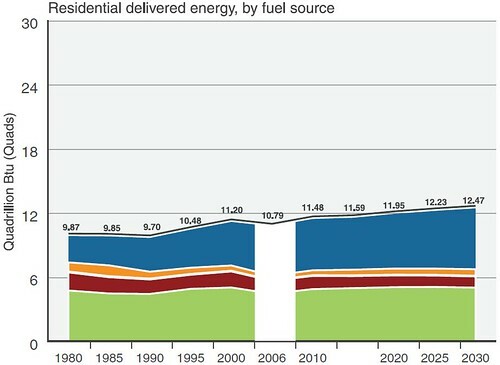 Source: DOE, Annual Energy Outlook 2010, Table 45, 2010. There are several types of petroleum fuels used for transportation. 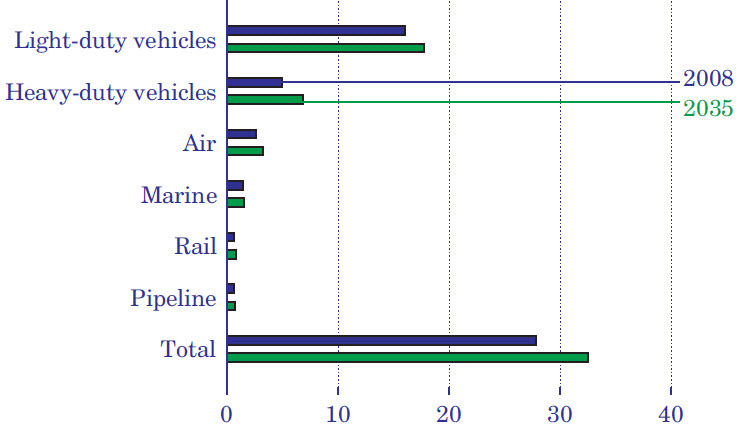 Aside from a small amount of natural gas, petroleum based fuels account for the vast majority of fossil fuel energy consumption in the transportation sector. Non-fossil based energy sources account for only approximately 3 percent of the total energy consumption for transportation. 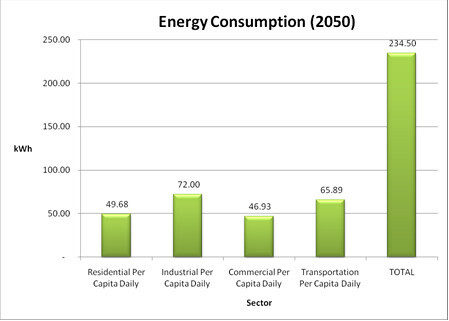 The Energy Information Administration released future projections of energy consumption for each sector in their 2010 Annual Energy Outlook. The projections reach into the year 2035. According to the Annual Energy Outlook, future trends show petroleum’s share of liquid fuel use will decline while alternative fuels such as biodiesel, E85, and ethanol for blending will increase for the transportation sector. Biofuels, derived from biomass, include solid biomass, liquid fuels, and biogases. Since 2005, the production and consumption of biofuels has increased due to the state and federal renewable fuel standards and account for more than eighty percent of liquid fuel consumption growth. The following chart shows EIA’s projections for the transportation sector. According to the EIA, the transportation sector’s energy consumption will increase from 27.9 quadrillion Btu to 32.5 quadrillion Btu from 2008 to 2035. This is an average annual growth rate of 0.6 percent. Historically, the average growth rate for 1980 to 2008 is 1.3 percent. The EIA sites demographical changes, improvement in fuel economy, and increases in pleasure travel to account for the slow-down in growth rate. An increase in energy demand for light-duty vehicles rises from 16.7 quadrillion Btu in 2008 to 18.37 Btu in 2035. This ten percent increase is equal to 800,000 barrels per day. 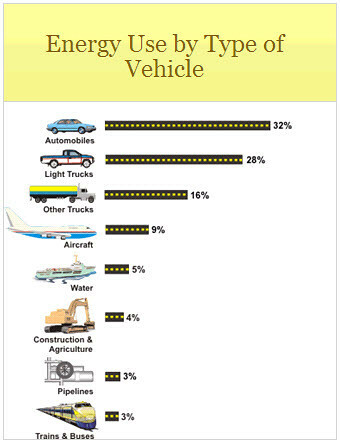 Heavy-duty vehicle energy demand increases also by thirty-seven percent. This significant demand increase is in part due to only modest improvements in fuel economy and manufacturing production which will be further explored in regards to natural gas. Air travel energy demand increases with rising income per person and relatively low fuel costs. This, tempered by increased fuel efficiency for air travel, results in a twenty-four percent increase in air travel energy demand in 2035. Slight increases in marine and rail energy consumption occurs due to increased transportation of coal. Pipeline consumption also increases with growth in transportation of natural gas and biofuels. Natural gas is currently utilized only in a small number of heavy-duty vehicles, out of 8.7 million heavy-duty vehicles, approximately 27,000. Consequently, fueling infrastructure development for natural gas has been modest. Energy security and environmental worries regarding the usage of primarily petroleum-based fuels for transportation has fueled efforts to turn to other sources. Recent shale plays have enabled the EIA to project future use of natural gas as a more significant fuel source for transportation. Consideration for new policy proposals to increase natural gas use for vehicles is mounting. 0.2 percent of fuel for all highway vehicles and heavy trucks comes from natural gas. Heavy-duty trucks are thought to be the best mode of transportation for which to incorporate the use of natural gas. According to the AEO, domestic freight trucks consumed over two million barrels of petroleum-based diesel fuel daily in 2008, accounting for fifteen percent of petroleum consumption for the sector and twelve percent for all sectors. In 2035 it is projected they will consume 2.7 million barrels daily. This future growth amounts to twenty percent of transportation and fourteen percent of overall consumption. Although still a relatively small number, due to high incremental costs, it is projected in the AEO that 260,000 of the 15 million heavy-duty trucks in 2035 will be heavy-duty natural gas vehicles. Overall natural gas consumption in the United States is projected to increase to 24.9 trillion cubic feet in 2035, this from 23.3 trillion cubic feet in 2008. Increased natural gas production, as a result of the increased natural gas demand for transportation, will cause prices to rise and affect all sectors. As a result, the AEO anticipates the demand in other sectors will decrease, notably in electric power, and cause a shift to coal use for generators in some instances. By 2035, availability of new hybrid vehicles is anticipated. Gasoline and diesel-electric hybrids, micro hybrids, as well as plug-in hybrid electric vehicles should all be on the market. Micro hybrid electric vehicles for which only battery power is used when idling are projected by the EIA to make up over half of hybrid car sales and thirteen percent of all light-duty vehicle sales in 2035. The EIA does not, however, anticipate a major effect on electricity demand as a result of the increase in plug-in hybrid electric vehicles. Electricity demand increases a mere .1 percent for every million vehicles and this is not enough to temper the anticipated slow-down for electricity demand. Below is a pie chart representative of our consumption calculations for the Transportation sector in 2050. Source: Intergovernmental Panel on Climate Change (IPCC), "Transport and its infrastructure." In Mitigation of Climate Change. Contribution of Working Group III to the Fourth Assessment Report. Cambridge: Cambridge University Press, 2007. Figure 5.3. The EIA defines the commercial sector as: “An energy-consuming sector that consists of service-providing facilities and equipment of businesses; Federal, State, and local governments; and other private and public organizations, such as religious, social, or fraternal groups. The commercial sector includes institutional living quarters. It also includes sewage treatment facilities.” The commercial sector comprised 18% of total U.S. energy consumption in 2007 and this is projected by the EIA to grow to 21.2% in 2035, with our continuation of these projections indicating a level of 19.9% in 2050. Despite this increase relative to the other sectors, total energy consumption for the sector is predicted to decrease by 3.5% from the 2007 level. This means that the average decrease per year is a miniscule 0.1%. The relative increase reflects projections of lower energy usage for the industrial, residential, and transportation sectors. The EIA conducts a national survey entitled the Commercial Buildings Energy Consumption Survey (CBECS) every 4 years that collects information on the energy-related characteristics and usage of commercial buildings. The most recent update is comprised of data from 2003. The CBECS offers an interesting look at recent and more distant past energy usage for the sector that provides a template for understanding current consumption and the impact of changes in consumption patterns going forward. For instance, in 2003, a breakdown of energy intensity per climate zone (as established by the National Oceanic and Atmospheric Administration (NOAA)) shows that energy intensities in regions 4 and 5, which correspond roughly to the South and Deep South, tend to be lower than that of the more northern and western regions. This would seem to indicate that heating requires more energy than cooling, or that zones 4 and 5 are more temperate in general. 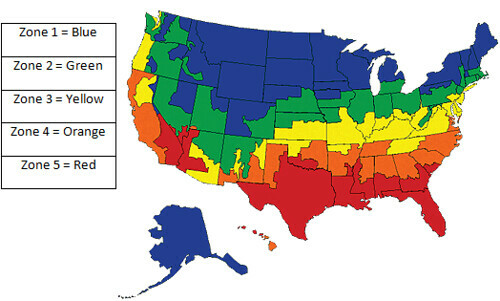 When the energy intensity of electricity is examined by census region, the South is the highest by a significant margin, indicating that air conditioning is a major differentiator of energy consumption between regions. 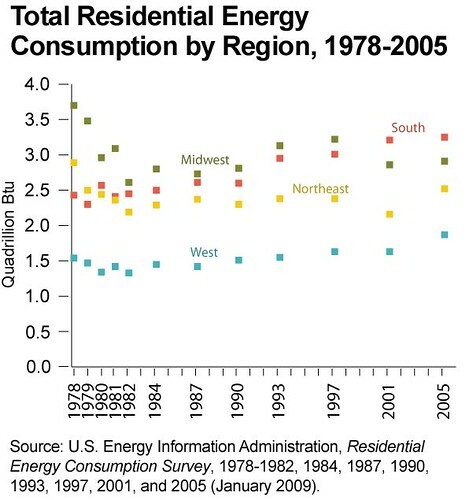 Aggregate energy consumption for the sector across time also yields an interesting perspective on U.S. energy use. Developed country economies have been shifting more and more toward services and it is possible that this trend may be reflected in chart below. The U.S. has moved from a primarily agricultural economy, to an industrial economy, and now to a service economy, and the increased energy intensity since 1959 may be a consequence of this shift. The Annual Energy Outlook 2010 released by the EIA breaks energy consumption for the commercial sector into the following categories: Space Heating, Space Cooling, Water Heating, Ventilation, Cooking, Lighting, Refrigeration, Office Equipment (PC), Office Equipment (non-PC), and Other Uses. If the 2007 levels are compared to 2050 levels, some interesting trends emerge. The first 8 categories show decreases and the latter 2 increases. This is interesting for several reasons. Consumption related to PCs is projected to rise in the short-term, but decrease by an overall level of 15% from 2007 – 2050. This is likely due to projected increases in the efficiency of these units. This efficiency is not expected to apply to other office related equipment. Lighting energy usage is expected to decrease by 21.2%, which could be due to using more efficient bulbs, or other efficiency-related technology or procedures. Also of note is that the largest category is Other Uses, which is projected to have an increase of 21.6%. This category comprises service station equipment, automated teller machines, telecommunications equipment, [and] medical equipment.” Many formerly labor intensive processes in the service industry are being automated, and the medical sector is projected to be a growth industry owing to demographic trends that will be touched on later, so it is reasonable to expect this category to show strong growth. 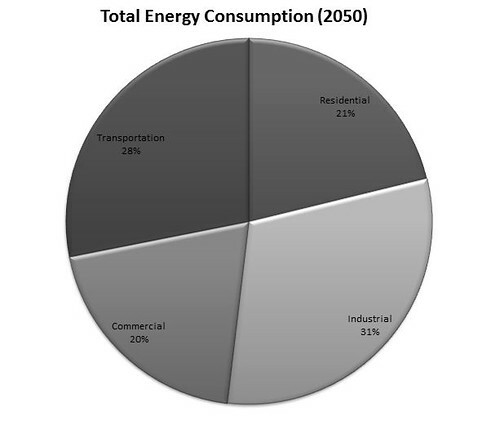 Industrial consumption is, per unit of energy, consistently the largest segment of energy use in the United States. The industrial sector also represents more than one third of total energy use on a global level. Consumers may be aware of the amount of energy used by their consumer goods in everyday life, but few are aware just how much energy goes into producing these goods. The industrial sector, as referenced by the U.S. Department of Energy, includes businesses with NAICS codes from 311 to 339, and is comprised mainly of manufacturing, agriculture, forestry, fisheries, mining, and construction. In general, manufacturing type industries are heavier consumers of energy than the other types. The industrial sector is unique because it involves a relatively small number of actual consumers, but they consume on a very large scale. 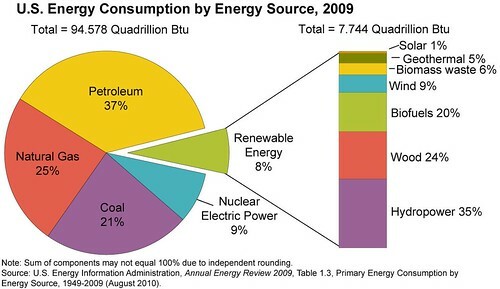 This accounts for some of the major differences between industrial energy consumption and any other type of consumption. 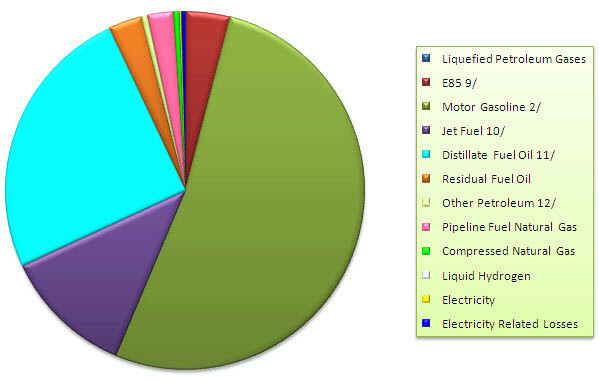 In contrast to individuals and commercial buildings, industries are powered by a wide variety of fuel types. Currently, natural gas dominates the portfolio of fuels, followed by purchased electricity. Renewables and biofuels are currently a very small part, but their use is expected to increase in future years. Coal liquids are also expected to emerge as a fuel source for industries in the coming years. A breakdown of the various fuel types in proportion to their contribution to overall industrial consumption is displayed in the graph below. Somewhat ironically, the petroleum refining industry is the most energy consumptive, with 32 percent of overall industrial consumption. This accounted for 7% of total consumption in the United States for 2006, or 6.7 quadrillion BTU. However, this includes manufacturing of petrochemicals for uses other than energy as well as fuel refining. Other very energy intensive industries include chemical manufacturing, paper production, and metal manufacturing. A breakdown of recent manufacturing industries' consumption by subsector, as reported by the EIA's Manufacturing Industry Trend Data, can be seen below (Projected to the year 2050). Total energy use among all of the subsectors can be divided based on end use within the manufacturing operation. The highest use of energy overall is devoted to process heating, or the heating of products during the manufacturing process. Process heating accounts for 34% of all industrial energy use. The next largest consuming activities in industry are machine drive and boiler heating. A complete view of industrial end uses can be found in the graph below, divided into categories of indirect uses, direct process uses, and direct nonprocess uses. As one could guess, end uses vary significantly between the many sectors of industrial production. Analysis of the three most consumptive manufacturing types, paper, wood, and petroleum, as well as a relatively lower use industry, food, reveals some important distinctions. Both food and paper manufacturing differ from the industry as a whole, in that process heating is not the most significant use of their power. 32.59% of the energy used in food production goes to boiler heating, an indirect use. In paper manufacturing, cogeneration processes are the main energy users. Petroleum refining, on the other hand, uses massive amounts of energy in process heating, well above the industry average. This process is an underlying factor in the fact that refining is one of the most energy intense industries around today. The majority of the chemical industry's energy is split between boiler use, cogeneration, and process heating. These divisions can be seen in the diagram below. 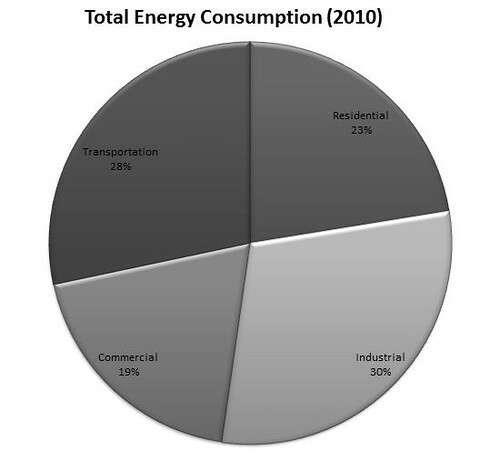 The relative amount of energy used by these manufacturers and the proportions going toward each end use make up the total energy consumption mix by industry in the United States. The industrial sector and its specific makeup of individual industries will therefore be a major factor in our energy future. Although industry accounts for the highest use of energy, the other three categories of consumption have grown more steadily than industrial consumption in the United States. This can be explained by the fact that commercial, residential, and transportation consumption growth are very closely tied to population growth. Also, industrial production is the most prone to outsourcing of the four energy use types. Industries also tend to be more reactive to economic shocks and recessions than individuals. However, overall growth associated with industry in the United States would suggest that these are not the most significant factors at work. Among reasons cited by the U.S. Department of Energy for trends in industrial consumption is a shift within manufacturing from more energy intensive to less energy intensive industries with high value products, such as electronics. According to the 2006 Manufacturing Energy Consumption Survey, energy used in production of chemicals and primary metals has declined, while food and other manufacturing have risen. On the other hand, there has been relative growth in manufacturing industries compared to the other, less energy intensive industries as a percent of total industrial GDP. Considering the net of these effects, although GDP in industry has increased 64% from 1985 levels, energy use has only increased by 12%. Energy intensity in the industrial sector also fell by 19% from 1985 to 2004, further separating GDP and population growth from the change in energy consumption. The following graphs portray the shift in these effects from the 1985 base, as well as their relative net effects. Moving forward, the EIA’s 2010 Annual Energy Outlook predicts an 8 percent increase in heat and power consumption, the largest category of industrial energy use, from now until 2035. This prediction is again in spite of more rapid industrial growth (predicted at 44%) as a result of the shift factors explained above. In addition, the use of fuels as feedstocks, or raw materials in the production of other chemicals, is projected to decline, freeing up that supply of energy to be used to power manufacturing processes. In general, more fuels are expected to be added or play a more significant part in the manufacturing energy mix as we move into the future. According to our projections, energy use per capita daily is expected to decrease by 13.1% from 269.91 kWh to 234.50 kWh in the U.S. On a per annum basis, this is a very moderate decrease of 0.3%, but given that total world energy demand is on pace to double by 2050, according to the World Energy Council, any reduction is quite striking, especially given that U.S. energy use per capita is quite high. Many portions of the developed world are expected to demonstrate similar energy usage profiles, with growing demand in Asian countries driving the projected need for increased energy supplies. If these trends are taken as given, it is important to evaluate contributing factors and the implications and questions inherent in such a course. Researchers in Germany have examined the energy consequences of an aging population, and if Germany is representative of the rest of the developed world, including the U.S., it is likely that the study is relevant for the current discussion. Since 1972, the number of births per year has been lower than the number of deaths. This has been the result of a low birth rate, and the general trend of individuals in developed countries to live longer, healthier lives. According to the authors of this study, “energy intensity of consumption is barely affected, [but] the consumption of different types of energy displays stronger reactions.” Older individuals are not likely to change overall energy consumption levels, but tend to use a different mix of fuels. They tend to be less mobile, using less gasoline and transportation fuels, but more heating fuels, since as natural gas. Population shifts may make a difference in regional energy use going forward as well, as different regions exhibit different consumption patterns. Statistics released by the U.S. Census Bureau claim that only 11.9% of Americans moved to a new location in 2007 – 2008, which is the lowest level since the bureau began tracking the statistic in 1948. This means that the consumption effects of interregional migration may not be as great as some suppose. According to the Pew Research Center, net migration flows show that the South was the most popular destination by a significant margin, with the West a distant second. This is significant as the South has lower energy intensity than other regions and uses more electricity for cooling, as opposed to heating fuels. Energy efficiency gains have the potential to greatly impact American energy consumption going forward as they have in foreign countries and in America’s recent past. According to the book Energy Security Challenges for the 21st Century: A Reference Handbook, by Gal Luft and Anne Korin, Japan is a interesting case study in energy efficiency. Japan has very limited domestic energy supplies, and following the Arab oil embargo in 1973, they took strong measures to reduce energy intensity to maintain economic viability. These measures, combined with a shift to the development of the high technology and microelectronics industries, allowed Japan to maintain a high economic growth rate following the embargo, while reducing its energy intensity. The oil embargo also provided the impetus for Americans to reduce their reliance on imported oil by increasing efficiency in the late 1970s and early 1980s. From 1979 – 1985, U.S. oil consumption decreased by 15%, oil imports by 42%, and imports from the Persian Gulf by 87%. 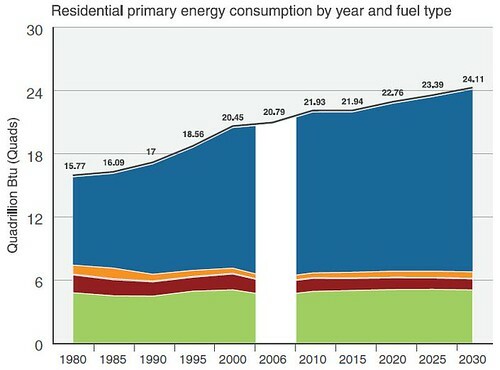 If similar gains were realized going forward, total consumption and the relative mix of fuels could drastically change energy use projections. The thesis that American and developed economy energy intensity will decrease in the future is based on statistics indicating that current energy intensities have diminished as those economies have become more service-based. This is an entirely plausible scenario, but may not be entirely accurate. For instance, Ted Trainer of the University of New South Wales, has identified 4 major reasons for rejecting the previous conclusion. The first is that GDP figures may not accurately portray actual economic activity, thereby reducing the significance of GDP to energy ratios. Many activities such as home cleaning and food preparation that were formerly performed in the home, have now become part of the cash economy, monetized, and become part of GDP calculations. Many services do not actually provide any real economic production or benefit, and much of foreign direct investment (FDI) does not stimulate new industries or production, but merely allows foreign firms to expand sales markets. These activities do add to GDP figures, however. The second reason is that different energy forms have higher utilities, for example, a mega joule of electricity is typically more beneficial than a mega joule of coal or oil. Much of the seeming gain in energy efficiency may be due more to using more quality forms of energy than an increase in the amount of value achieved per unit of energy. Developed countries may actually have lower domestic energy intensities, but that does not mean that they are not responsible for energy use in other countries, as the energy used to produce goods for domestic consumption abroad is not included in the energy intensity calculations. An indicator of this is that garbage volumes in domestic countries have not diminished in recent years, but have increased by a large amount. Although our projections plot a course of reduced energy intensity in the U.S. going forward, this may not actually be the case, and results may differ for a variety of reasons, among which are age-related demographic shifts, regional population relocations, and energy efficiency gains.